There is a lot going on in my life right now. College life while still working full-time is starting to really stretch me and thought the posts on Jamaipanese.com has slowed down a little I am still making notes and have a couple interested projects working on for this blog. 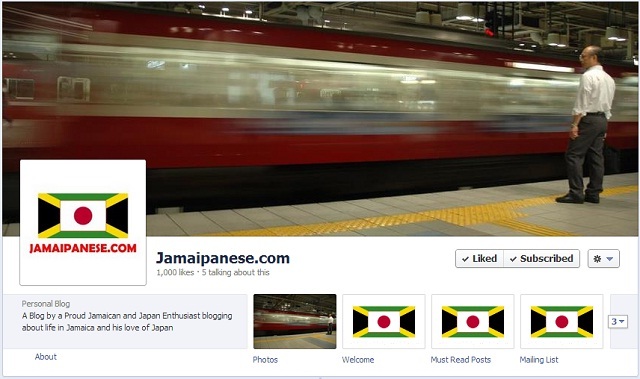 I’ve been watching the “like” count for the Jamaipanese.com Facebook page slowly trickling towards 1000 over the last few days and this morning it finally hit the four digit mark! A big THANK YOU to everyone who has liked my Facebook page and continue to support the blog. I took some time to analyse the stats for the page and realised that Jamaipanese.com truly is global with likes from all over the world; places such as Australia, Denmark, Mexico and of course the top 3 – The United States, Jamaica and Japan. Thank you all again. The real high-point for likes came during the last stages of Operation Visit Japan and peeked while I was in Japan last September – a recap of all the posts related to my time in Japan can be found under the Japan 2011 tag. I hear you! I’m always busy to no end as well, so that doesn’t include college life.